A 10-week discipleship course. 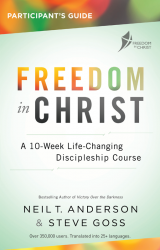 Kit includes a copy of the leader's guide, a participant's guide, the DVD and the new Steps to Freedom in Christ. Now Available! Enjoy your true nature in Christ with Steve Goss's first of four books. The second of Steve Goss's four books helps you stand firm in God's strength. Don't let the past hold you back with the third of Steve Goss's four books. Don't let anything or anyone hold you back from the you God planned. The fourth of four books by Steve Goss.